Each individually designed room features opulent interiors with dark and decadent finish. And a trip to Manchester isn't complete without popping into the Manchester Cathedral, housing a gorgeous interior with the best late medieval woodwork in the north - the spire and the ceiling are splendid and full of life. 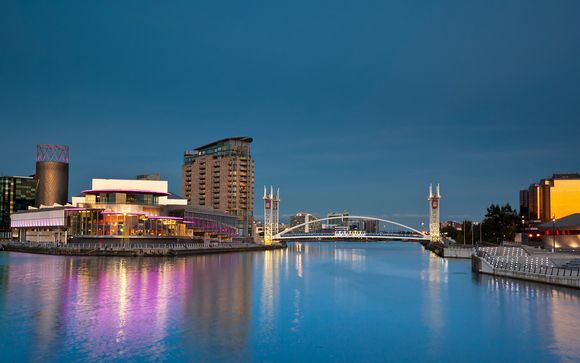 Then, indulge in some of the city's best shopping, absorbing both vast shopping centres and the smaller local markets. Visit The Arndale Centre for your high street favourites, or head to the Northern Quarter, where you can get anything from vintage clothes shops to independent record and book stores, and edgy fashion labels to quirky gift shops. 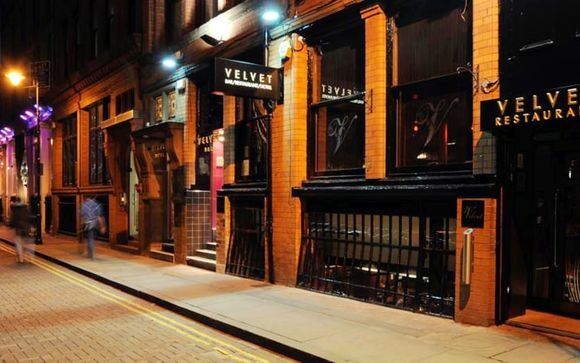 The Velvet Hotel is an intimate boutique hotel in the centre of Manchester, located within walking distance of Manchester Piccadilly train station and Piccadilly Gardens, with discounted local parking available. Housed in a 19th century textile building, this trendy 4-star hotel offers visitors a unique stay in the heart of the lively city. At the Velvet Hotel, the individually-styled guestrooms and suites each exude a rich personality, furnished with inviting beds, sumptuous fabrics and bold wall coverings. In-room spa treatments are available and all rooms are equipped free WiFi, flatscreen TVs and en-suite bathrooms with REN toiletries. - Velvet King Room (19m² / max. 3 persons or 2 adults): Luxurious Venetian beds, rustic exposed brick or Moroccan tapestries...each room has been individually designed to create a welcoming and decadent retreat. - Velvet King Room above the bar (19m² / max. 3 persons or 2 adults): These rooms have all the style of the other room with the added ambience of the bar below. - Balcony King Room (26m² / max. 2 persons): 3 of the hotel's rooms lead onto a private balcony overlooking the iconic canal street. - Penthouse Suite (28m² / max. 3 persons or 2 adults): These trendy, 2 story penthouses are bathed in light from the roof windows that stretch from one end of the penthouse to the other. A real destination venue, Velvet bar pulls in the pre and post restaurant customers as well as the after-work drinkers and hotel residents. This sumptuous bar has an impressive & extensive cocktail list and a prime pitch for canal-side drinking when the sun's out. Throughout the past decade and then some, Velvet restaurant’s popularity has continued to increase, with a mixed clientele of locals and visitors to the city co-mingling to create an inclusive ambience. A warm and friendly welcome awaits, once you have taken the ‘walk of faith’ over the glass fish tank cleverly set into the entrance stairs. The Restaurant matches its memorable design features with a combination of excellent food and eclectic music style and is open throughout the day for a soup and sandwich lunch, small plate selection, a pizza or a twist on classic British comfort food. Weather permitting, customers also have the choice to dine al fresco, canal-side.